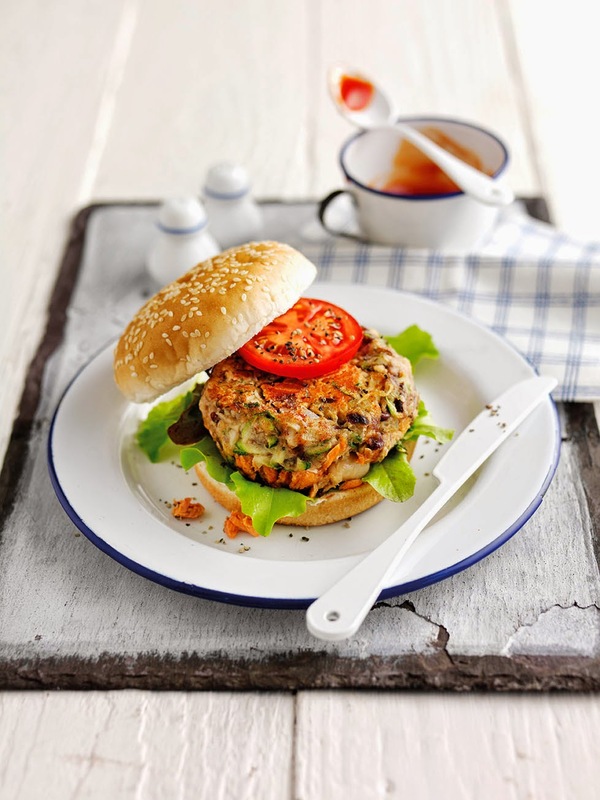 Cook up a delicious treat for dad this Father's Day with these Cajun-style spicy Alaska salmon burgers. They're easy to make and can even be prepared the day before if you're short on time. Drain the salmon and remove the skin and bones, if wished. Break into large chunks. Put the cannellini and kidney beans into a food processor with the red onion, celery, thyme, egg yolk and Cajun seasoning and blitz together, though avoid over-processing. Tip into a bowl and mix in the grated courgette and salmon chunks. Season with black pepper. Form the mixture into 4 burgers. Beat the egg white with 2 tbsp water and brush over the burgers. Heat the oil in a frying pan and cook the burgers over a medium heat for 8-10 minutes, turning occasionally. Toast the cut sides of the burger buns and pile lettuce leaves on top of the bases. Place the salmon burgers on top, then finish off with tomato slices and gherkins. Cook's tip: Choose different bread for serving the burgers, such as ciabatta or granary rolls.